Well, after saying I was excited about having a day off on Friday it may have been cruelly snatched away from me…or not. Yesterday at work I was asked to attend a special monthly clinic that takes place at another hospital…on Friday morning, If I don’t go this Friday it’s another month before I can go again. Remember how I said yesterday I had forgotten how I had Friday off but now I know I do the idea of giving up the day off is disappointing. I’m not sure why when I have no specific plans for the days and up til 36 hours ago didn’t even know I was going to be off…but there you go. Whatever I do on Friday, even working, it’s going to be fun and interesting. I guess that’s the way to look at it? 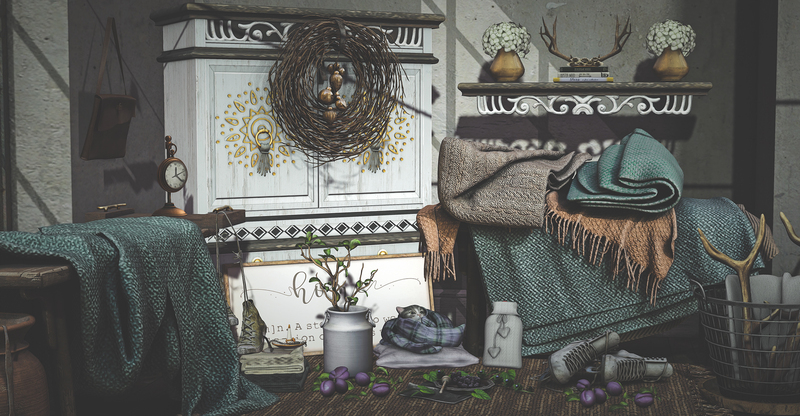 Shiny Shabby is open and as always there is a new release from Nutmeg to check out. I’m featuring a couple of the items, as well as some previous Nutmeg releases. I will be featuring more of the Dahlia release from The Epiphany too but there’s a few of their gorgeous items included in the photo too!